Florida’s southernmost point is 1 mile wide and 4 miles long. There’s lovely running along the seawall, a loop around the trails of Fort Zachary Taylor State Park, some of the popular streets when not too crowded, and pretty side streets to enjoy some shade and pastel-hued, conch-style houses. Below, we recommend a few routes, but it’s easy to combine them to design your own route for desired length and mood. Key West 10-Miler. 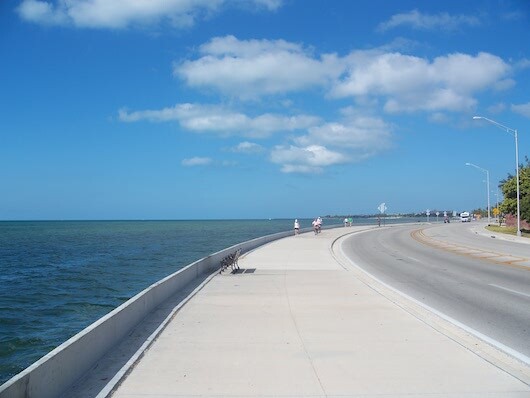 For a long run incorporating Key West’s highlights, this is a wonderful perimeter loop, with at least 50% featuring water views and off-road paths. Mallory Square is a good place to start. Take Front St. to the path along Key West Bight, across the Palm Ave. Causeway to N. Roosevelt Blvd. (Rt.1), and the beautiful palm-lined waterside path. The ‘back half’ is along the lovely path aside S. Roosevelt Blvd., around the airport to Fort East Martello Museum to Smathers Beach and along Atlantic Ave. to Higgs Beach, then right on Reynolds and left on South, to Southwernmost Point and then along Whitehead St. by the Hemingway Museum. Conclude via Whitehead or Front St.
S. Roosevelt to Southernmost Point: Wonderful running alongside the path of S. Roosevelt Blvd. DIY route: From the airport/Fort East Martello Museum, it’s 1 mile to Higgs Beach, and 2 miles to Southernmost Point for a nice 4 mile out and back. Add another ~1-2 miles with a loop around Fort Zachary Taylor Historic State Park. N. Roosevelt Waterside: Palm-lined waterside path along N. Roosevelt Blvd. It’s 2 miles one-way along the nicest section between 1st St., north to A1A and the terminus of the Overseas Heritage Trail. Fort Zachary Taylor State Park. National Historic Landmark. Couple of miles of nature/bike trails, including 1.1 mile Point Trail. Fort, great swimming/snorkeling beach at end, kayaking. Great sunset run! Note: opens at 8am. Old Town/Key West Side Streets. DIY run to enjoy Key West’s Old Town and pretty residential side streets, all with sidewalks. Very walkable/runnable. Take some of the east-west roads 1 mile across the island: Simonton, Duval, Whitehead, and add-on by enjoying some of the pretty residential side streets, north-south for ~ 1 mile between White St. & Emma St.: Truman, Southard, Fleming are good options.